Like any typical 22 year old girl, I like to drink well, cheap and chic. I braved watered down drinks, cheap tequila and (way too) high tabs to find the best drink specials in Dallas! Here’s my guide to the “Best and Booziest” featuring the cheapest (and the strongest) drinks in town everyday of the week. 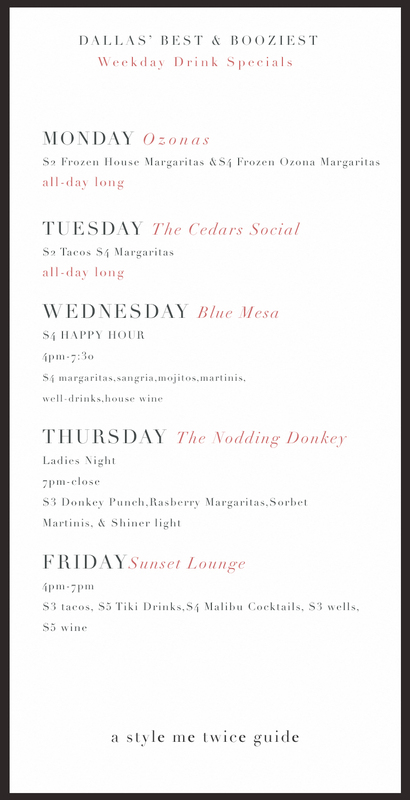 Go see for yourself and try out some (or all) of these places this week! This is absolutely fabulous– I needed this list! Might have to hit cedars tonight! Thanks for referring this list. It has some great deals and places that I have never been to, so checking them out should be fun!! Love the blog btw.